I confess that despite the academy award nominations and four-star reviews, I wasn’t really looking forward to The King’s Speech. In the back of my mind was the thought – “Come on – a full length movie about stuttering?” The first two minutes of the film changed all that as the genius of Colin Firth and Helena Bonham-Carter pulled me into the pain this affliction brings to sufferers. There are certain expressions you never forget in the movies, but I cannot recall such expressiveness, such anguish conveyed with so much restraint. 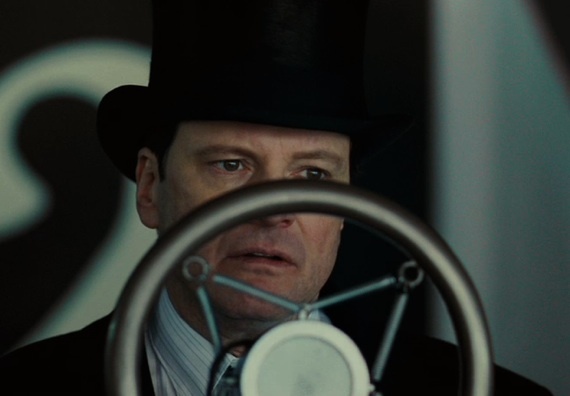 For an actor of the calibre of Firth, a glance or a momentary twist of the mouth can speak volumes. Firth plays Prince Albert, the Duke of York, second son of King George V, and father of the current Queen Elizabeth. As the film unfolds we glimpse the life-long pain “Bertie” has experienced – the badgering of his father and brother, and the failure he experiences at every “minor” address he cannot avoid. Out of sheer desperation, Bertie seeks the help of Australian speech therapist, Lionel Logue (Geoffrey Rush) – and none too soon, for history is about to raise the stakes to a higher level than most of us ever have to experience. His father’s death and his brother’s abdication leave Albert no choice but to ascend to the throne as King George IV. “I am not a king, I am not a king,” Bertie cries again and again in the most moving scene of the film. “I’m just a naval officer!” But a king he must become in a hurry. In the climactic scene of the film, he has to address his subjects all over the world when war breaks out with Germany. Bertie and Logue on their long walk to the radio room made me think of Frodo and Sam on their final ascent to Mt. Doom, and why not? Both are stories of people who feel completely inadequate to the demands of their fate, but who find the strength to act for their own salvation and that of their nation. The difference, of course, is that these events really happened. This entry was posted in Movies and tagged history, movies, postaweek2011. Bookmark the permalink. Thanks for sharing…I simply loved that movie. Wonderful review, Morgan. I can’t wait to see this. I was already looking forward to it, but now I’m really excited. Interesting comparison to the Lord of the Rings trilogy, which I also loved.